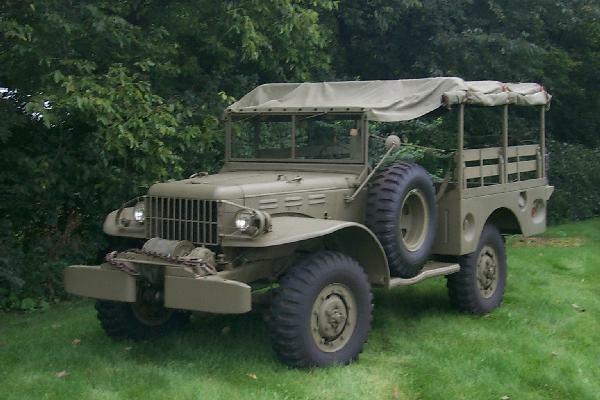 This weapons carrier, WC-52, began its true life as a grain truck on the family farm after my uncle acquired it as surplus equipment at the Tacoma ordinance plant in 1945. My uncle had driven it from there to the farm in Eastern Montana during the late fall in 1945 on a three day drive. I am sure it was a `warm' drive over the Rockies in an open cab. This vehicle was in fairly good condition before the restoration. Only minor modifications to the vehicle had been made. A Model T cab was attached to provide the occupants better protection in cold weather and the cargo capacity was enlarged for grain hauling through the use of additional vertical side boards. During the restoration, I became aware that little information was available for the cargo box description. It is primarily for this reason that I have compiled information for the cargo box and other related topics. Hopefully others who wish to restore a cargo box and do not have such a complete cargo box as I did can benefit from this web site. Careful drawings and notes were made concerning the cargo box for this late WW II vehicle, which was comprised primarily of white oak in contrast to earlier vehicles with metal cargo boxes. Other information provided involves the voltage converter for the 6 volt trailer (since this vehicle has a 12 volt system) and the artwork for a unique data plate. The line drawings in the html's are rendered in a gif format resulting in missing information. Clicking on the image will generate a pdf image with all the information in an 8.5"x11" format. Fri Oct 31 08:32:34 EDT 2008.